Pump will be rebuilt at time of sale. Specify desired heater voltage (120/208/240VAC). In addition to this Varian VHS 4, Capovani Brothers Inc stocks a wide range of used diffusion vacuum pumps. 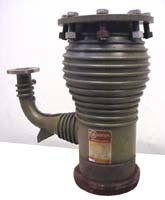 Typical manufacturers include Consolidated Vacuum Corporation, Edwards Vacuum, NRC, Varian, and Veeco Instruments.